A 24-hour all-Slow Jams radio station, featuring the best in classic and current R&B music. 24-hour live stream of oldies, old-school, and funk. Live chat and requests! 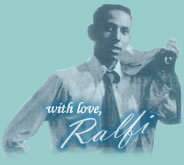 Hear the "Salsa Side" of Ralfi as well as other amazing salsa artists! An AOL music stream featuring artists like Santana, Los Lobos, Rene Rene, Juan Luis Guerra and more! An extensive blog about Latin Oldies including reviews on CDs and a great list of rare "treasures"